I used American Apparel Mannequin as a base, with American Apparel Cocoa for the brown, and Orly Luxe for the gold. Topped it all off with 2 coats of Seche Vite top coat. Ok, this chica is going to bed. hi im new follower of your blog. 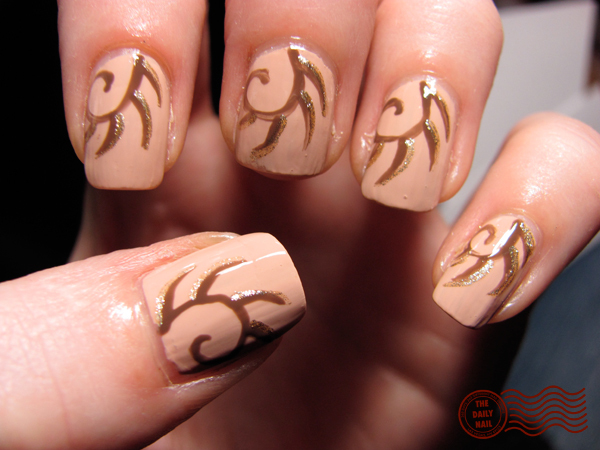 Im interested with your profile saying you plan to create 365 nail art designs in 365 days! sounds great to me since im new beginner of nail poliah/art lover. and how u getting the inspirations in creating nail art each day? SHE IS WONDERFUL AT THIS! Keep watching, it only gets better!!!!!!! I like the base color you used! Sounds like you need some rest! Hope you slept well! I really like your blog! My friend pointed me in your direction: I just got engaged so I'm putting more time into doing my nails :D You've got some good ideas.